We live in a time when humanity itself has become an ecological and evolutionary problem for the earth rather than a participating friend. At the same time we live in a unique epoch where many cultures of past and present come together, intermingle and fructify each other. 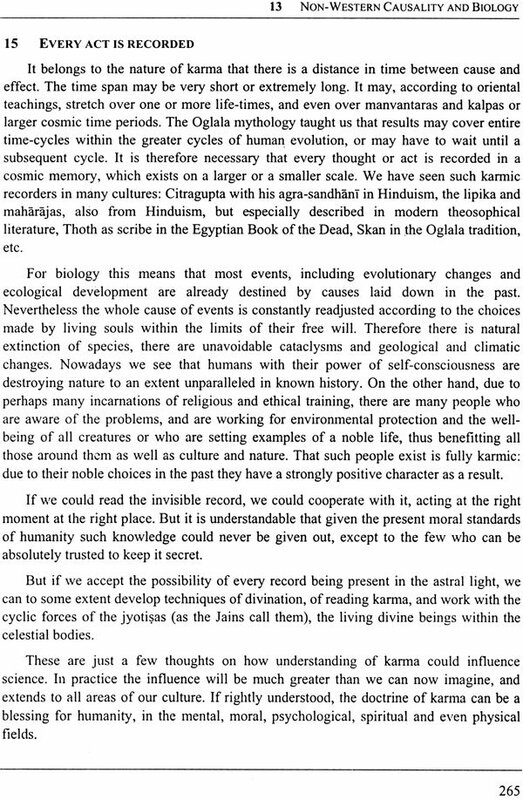 The concepts of cycles in nature, causality, hierarchical relationship, ecology and evolution are discussed from the angle of a select number of high cultures which determine our views and attitudes. This work is a selected presentation of important expressions concerning these concepts found in the cultures under study, their contrast with general occidental scientific thinking, and speculation about what may be the outcome of the blending of the heritage of the ages. At the end of the book, recorded interviews based on 20 questions with representative personalities in India, America and Europe have been printed in full. The study is carried out in full and equal respect for all human thinking, and it values the achievements for the great minds of all cultures under study on the same level. It is the conviction of the author that, running through the garland of multicolored beads which make up the totality of human evolution, is the thread called truth, and that, despite the differences in approach, truth is what everyone is yearning for. Rudi Jansma was born in 1949 in Rotterdam, the Netherlands. He studied Neotropical vegetation science and nature preservation. He worked for various environmental groups concerned with tropical ecosystems. Also he studied philosophy and Sanskrit. He did intensive studies in Theosophy and Eastern and other non-occidental thought systems, which lead to a Ph.D. at the Intercultural Open University. He traveled extensively and was in close contact with many cultures. At present he lives in Rajasthan, India. He hopes and expects that the knowledge and ethics of these and other cultures can significantly contributes to the global culture of the coming ages. Concepts of Philosophy and Science of Nature are a comparative study of basic concepts concerning the understanding of and the attitude toward nature among various cultures. Our purpose is to acquire insight into the understanding of nature in some of the great traditions of the earth. This will essentially change the attitude of mankind toward nature, both philosophically and in practice. Biology has acquired a wide scope in the West. 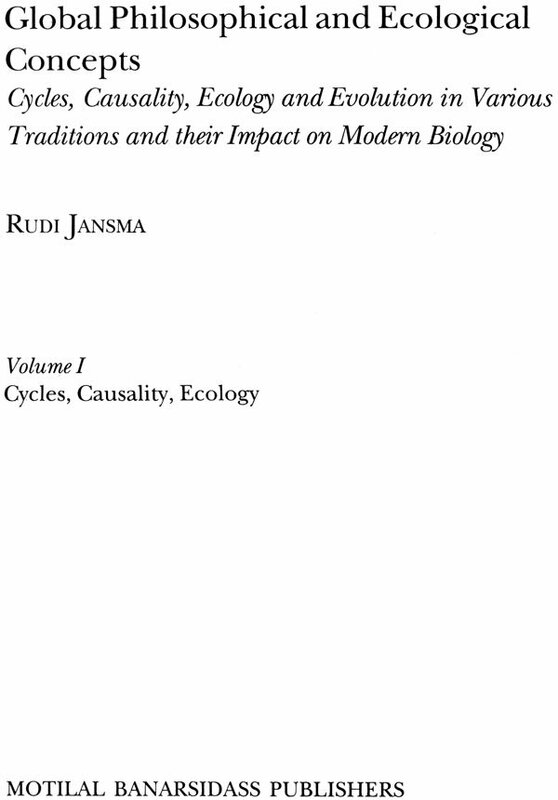 It is however noteworthy that western biology has been unable to prevent the human attitude which leads to the large-scale destruction of nature nowadays. 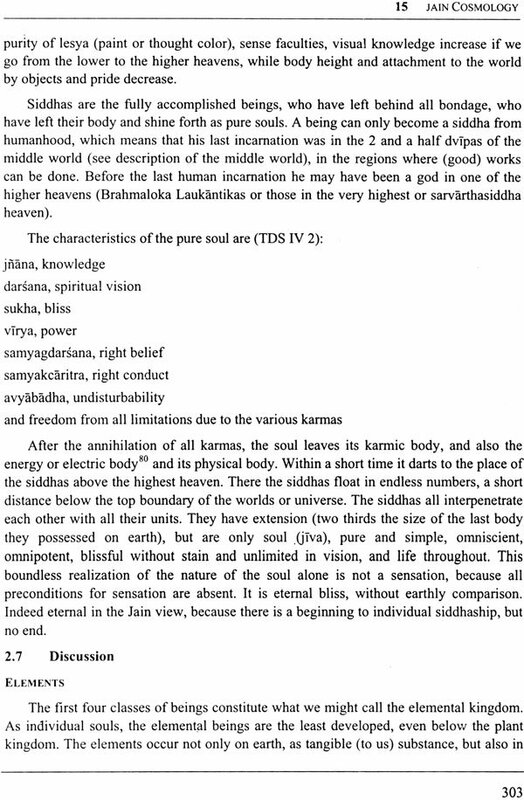 This dissertation is result of many rears of study of occult and religio-philosophical literature. Certain key ideas were found to be most fundamental for human thinking throughout the ages. These are also most relevant for our modern world culture, which will shape itself further in the coming centuries. They will be discussed below, and are the leitmotiv running through the whole work. This work is a selected presentation of important expressions concerning these concepts found in the cultures under study, their contrast with general occidental scientific thinking, and speculation about what may be the outcome of the blending of the heritage of the ages. 1. 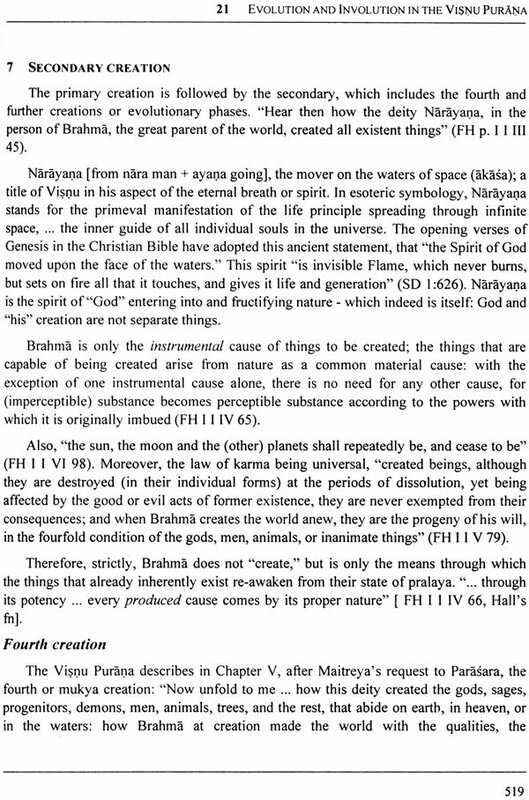 Hinduism, with emphasis on Advaita Vedanta, and puranic literature which contains much detailed information concerning the processes of Cosmogenesis and evolution. 2. Jainism, with emphasis on the Tattvarthadhigama Sutra, which gives us details about cause and effect relationships in nature, and about an ecological view which includes all living beings as well as invisible forces and intelligences in the manifested universe. 3. 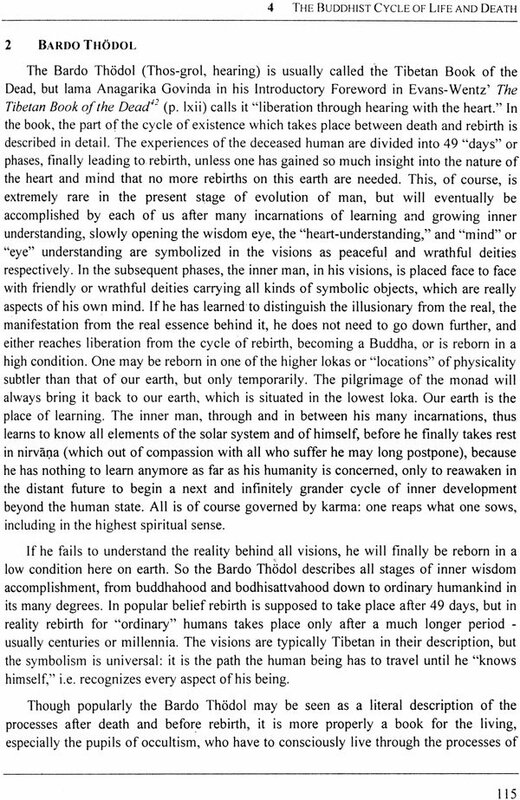 Buddhism, in its Mahayana interpretation which gives us insight into the cycles of existence. 4. Native American cultures. 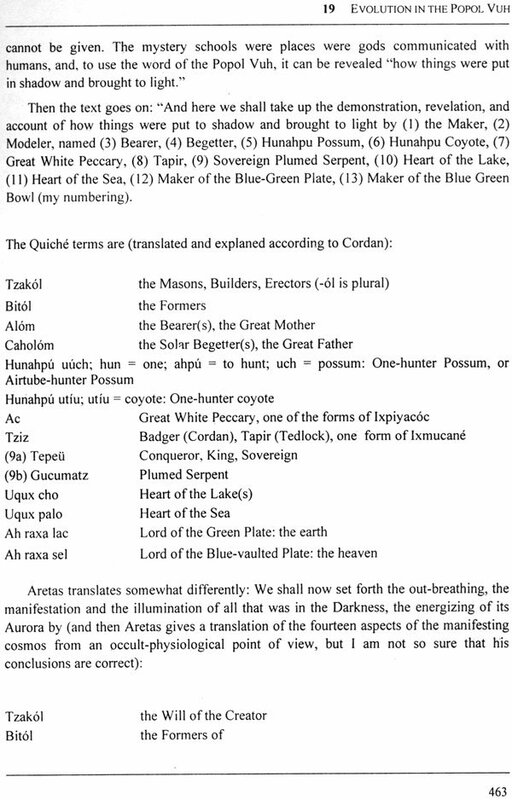 Those parts of the Maya Popol Vuh relating to evolution were analyzed. 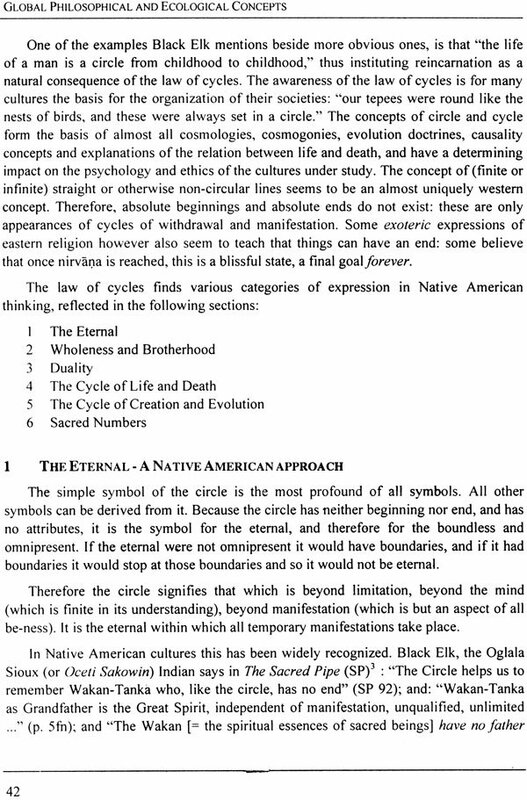 Of North American cultures the emphasis is on the myths and symbolism of the Oglala Sioux, who teach us much about the universal meaning of oneness, brotherhood, cycles, and the meaning of cause and of effect within cyclic existence. 5. Theosophy as expressed in its modern form places the wisdom teachings which are discussed in this paper in a universal light and deepens their understanding, thus showing the oneness of origin of all genuine teachings. 6. 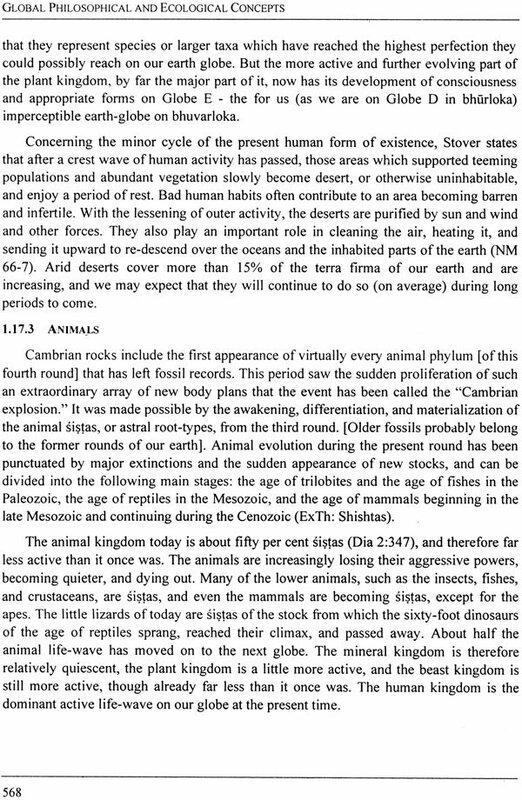 Some of the fundamental views of modern science concerning nature are discussed. This is always done in relation with the views of the other traditions which are the subject of this study. Occasional reference is made to other traditions. We live in a unique epoch where many cultures of past and present come together, intermingle, and fructify each other. Thus we have the unique opportunity to build a new view of life. The study is carried out in full and equal respect for all human thinking, and it values the achievements of the great minds of all cultures under study on the multicolored beads which make up the totality of human evolution, truth is what everyone is yearning for. 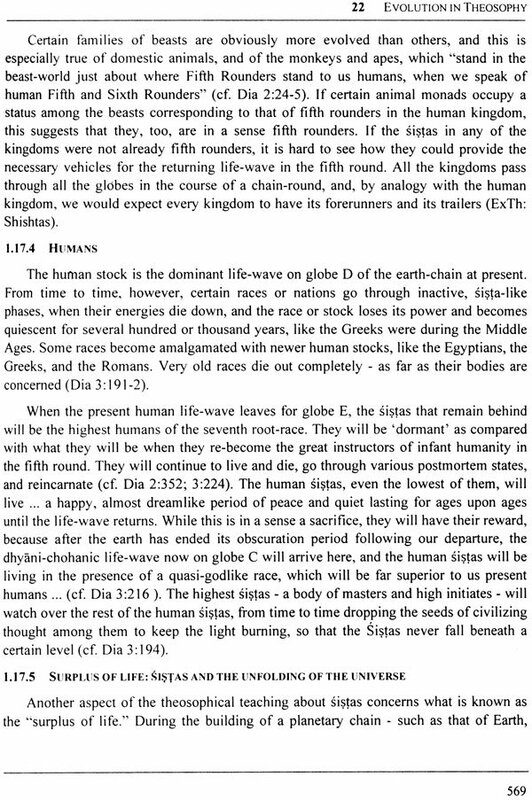 Just as among human individuals, some cultures may have been more intellectually or spiritually attuned than others, and some may have approached truth at deeper levels than others. In some cultures the orientation was far more spiritual than that one is generally aware. 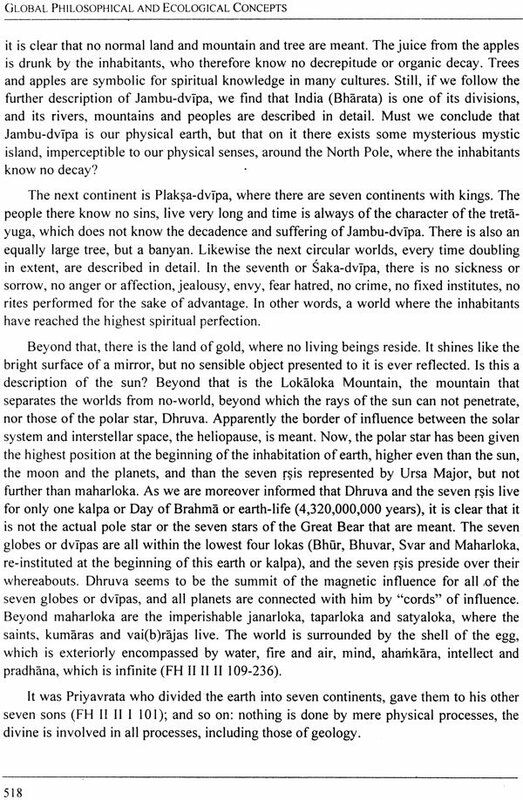 Also, every culture, like very human, penetrates the deeper levels of understanding according to its own svabhava, its own character. 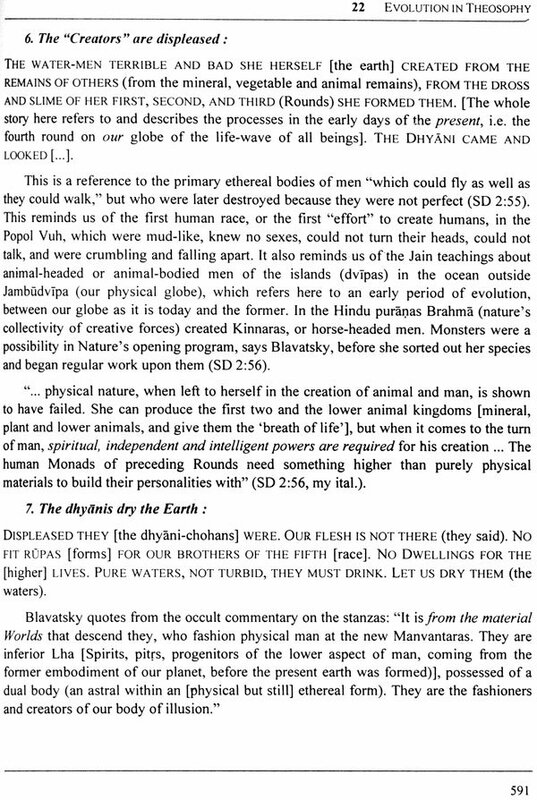 The totality of savabhavas makes up the spectrum of humanity throughout the ages on the whole earth. Today we have reached a stage where we can reap the fruits of all that. One of the aims of this work is to add to the mutual respect among cultures. Spiritual and practical knowledge have almost always been integrated. The worlds of the spiritual/divine and super-sensorial are intimately integrated in the events of the manifested world. Occidental thought of the last few centuries is the only exception I know of. The occident has studied the properties of matter and even sociology and psychology in an isolated way, rejecting super physical intelligence, super physical intuition and purpose, and tends to regard consciousness and life as products of matter which in itself is purposeless. But also in the west, and part of the greatest thinkers have often (thought more or less secretly) had connections. 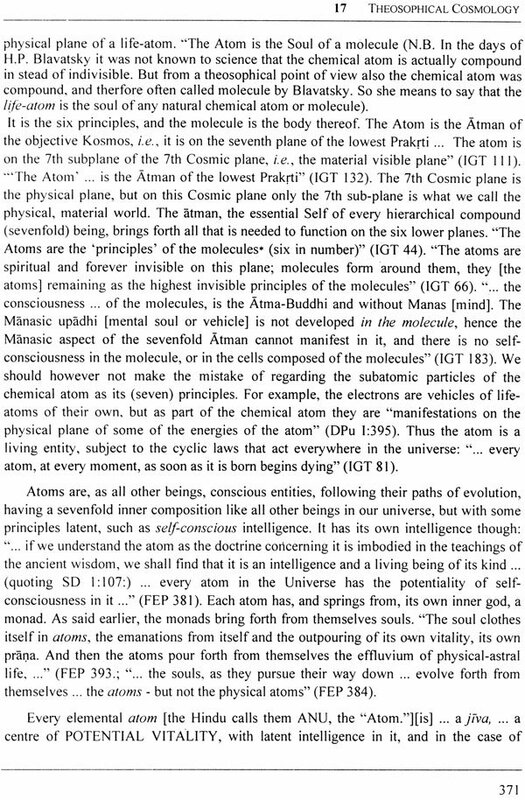 Such are, to mention a few, the Alchemists, Rosicrucians, Freemasons, Druids, Theosophists, and Anthroposophists. All these contain elements of the same spiritual knowledge found at the core of all great human cultures. In the world culture of today, the theosophical is- to my judgment- the most fundamental and pure. Theosophy seems to support- though greatly invisible to the masses, including scientists- the spiritual basis of our modern culture. Therefore, I include the purest modern theosophical teachings in this study. Apart from a study of literature, many interviews were audio-taped with representatives of the cultures which are the subject of this study during three seasons of field work in India and the United States. Lists of questions and the complete interviews are given in Appendix 5. As regards the question what is life? The modern occidental world deviates very far from others. 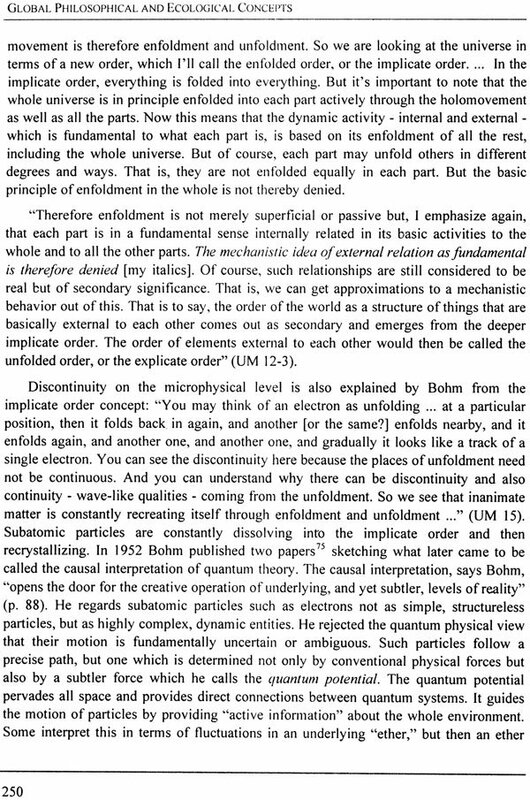 The gap between the occidental scientific axioms in this respect is so large that almost nobody dares to take the jump. To the western mind, including that of some of the most progressive biological thinkers of our days, life is conditioned by matter. 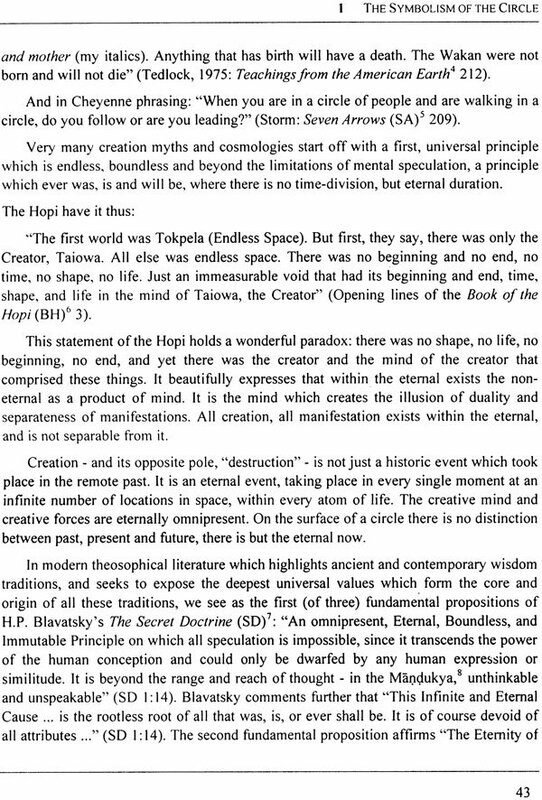 Life can only exist (or manifest?) within a very narrow range of physical and chemical conditions. It can only arise where chemistry allows the formation of carbon-based organic structures and at temperatures and pressures where (liquid) water can exist. Official research and speculation concerning extraterrestrial life directs its efforts toward planets, moons, or perhaps meteorites which may answer these conditions. If such conditions are not met, life is thought impossible, at least at present. Therefore life on Mars or Venus is hardly expected, or at best life in a very primitive or rudimentary from. Other conditions we attach to the definition of life are procreation and active movement. 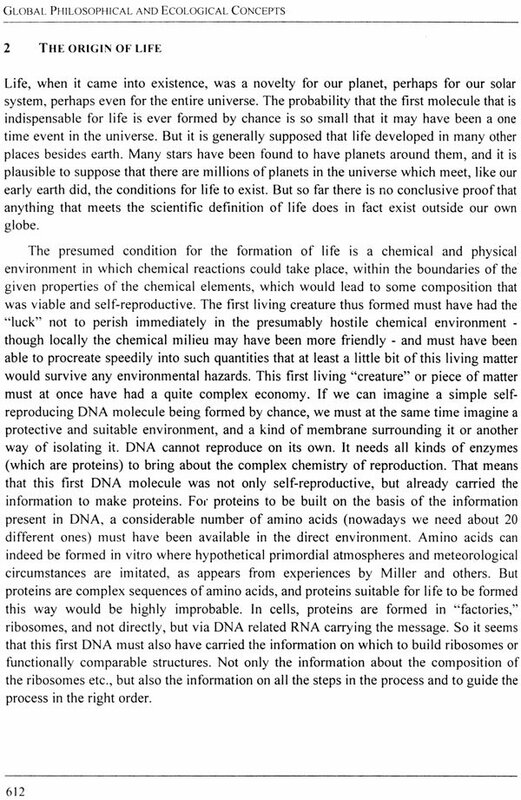 This separates nature into two parts: living and nonliving, organic and inorganic, having DNA and not having DNA. Consequently, minerals do not live, because they don't meet he requirements. Nevertheless, from a philosophical point of view, these conditions are quite arbitrary. 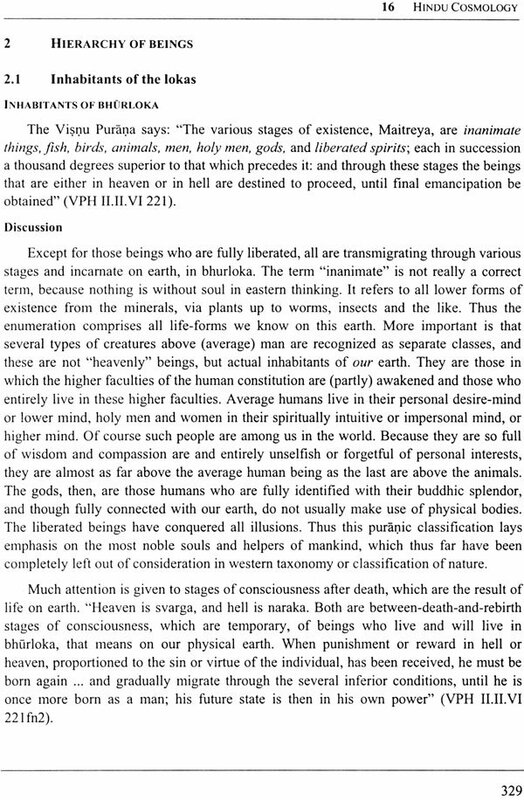 Rather they are descriptive of what we wish to include in the living world and what not, in order to satisfy our dualistic mind-set. But what if we detach life as a principle from these arbitrary conditions? What would happen if we were to define life as the energy of conscious existence? 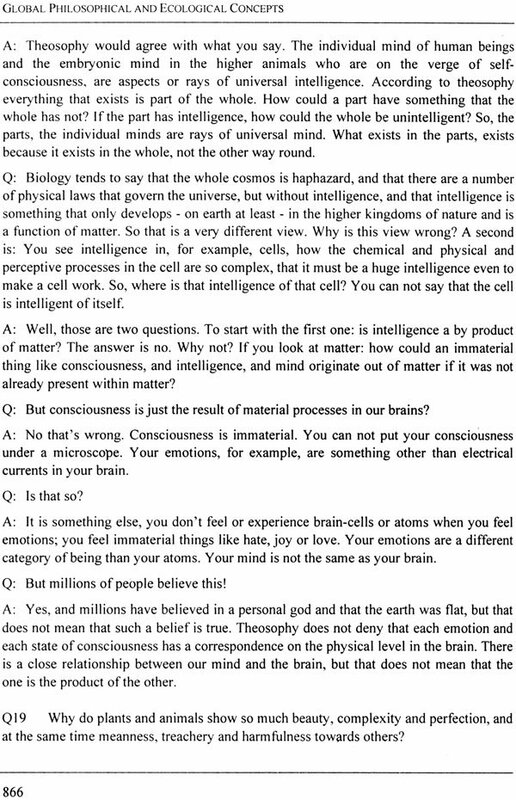 There is no irrefutable argument to define a point where consciousness begins and unconsciousness ends. As humans we may lose walking consciousness and enter dream consciousness, but does that mean that consciousness itself is interrupted? Is consciousness defined by DNA? If so, do viruses, bacteriophages and mitochondri have consciousness, while other complex organic structures or inorganic crystals do not? Perhaps consciousness is a matter of graduation. The occidental division into life and non-life, consciousness and non-consciousness may be practical in daily society, but not very philosophical. If we discard this duality, we see life as a universal phenomenon which connects all things within it. 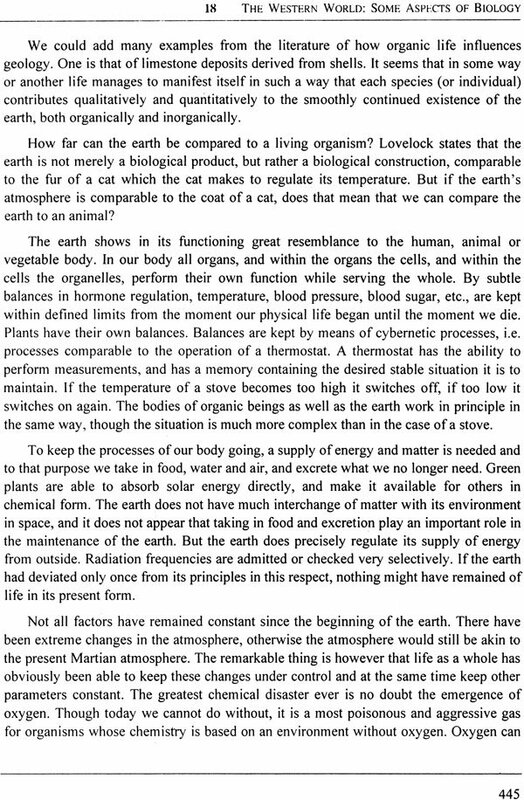 Then the earth is alive, minerals are, the other planets of our or other solar systems are, and the sun, the stars and any other galactic structure. Even dead matter is alive. 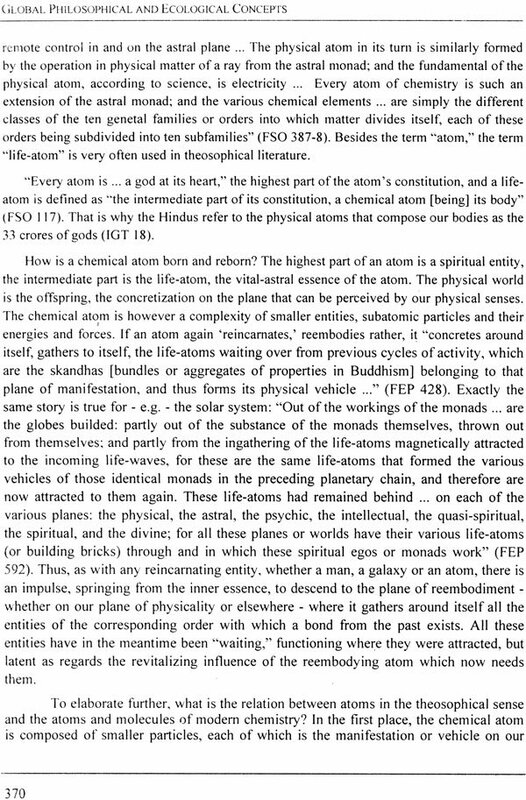 Life is no longer a mysterious phenomenon, mystically born out of dead matter as a result of particular molecular arrangements, but is the omnipresent consciousness-force in everything. We are indeed a living universe. This idea is at least as philosophically acceptable as the predominant occidental view. Yet the consequences resulting from the view we choose are tremendous. It seems a choice between darkness and light, because if the view of the universality of life is accepted, the whole universe becomes a living phenomenon, and everything that is essential to life becomes universally valid. 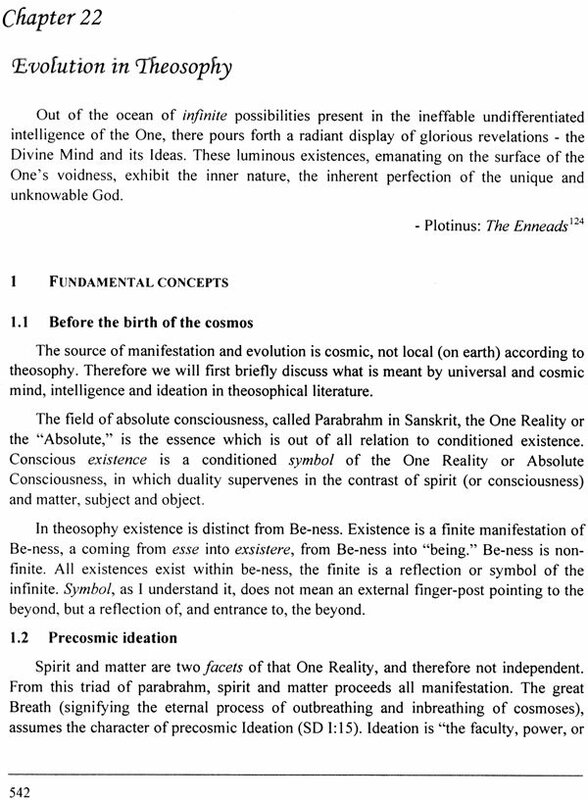 The occult definition of life as expressed in modern theosophical literature is "It is the One Life, eternal, invisible, yet omnipresent, without beginning or end, yet periodical in its regular manifestations, between which periods reigns the dark mystery of non-Being; unconscious, yet absolute consciousness; unrealizable, yet the one self- existing reality; truly, 'a chaos to the sense, a Cosmos to the reason.' Its one absolute attribute, which is ITSELF, eternal, ceaseless motion of the universe, in the sense of limitless, ever-present Space. That which is motionless cannot be Divine. But then there is nothing in fact and reality absolutely motionless within the universal soul" (SD1 1.2). Another theosophical work adds: "Life per se is conscious, substantial, spiritual force, manifesting in myriad ways as the various lives and as forms of energy, whether macrocosmic, microcosmic, or infinitesimal. Force and substance, or life-substance-intelligence. 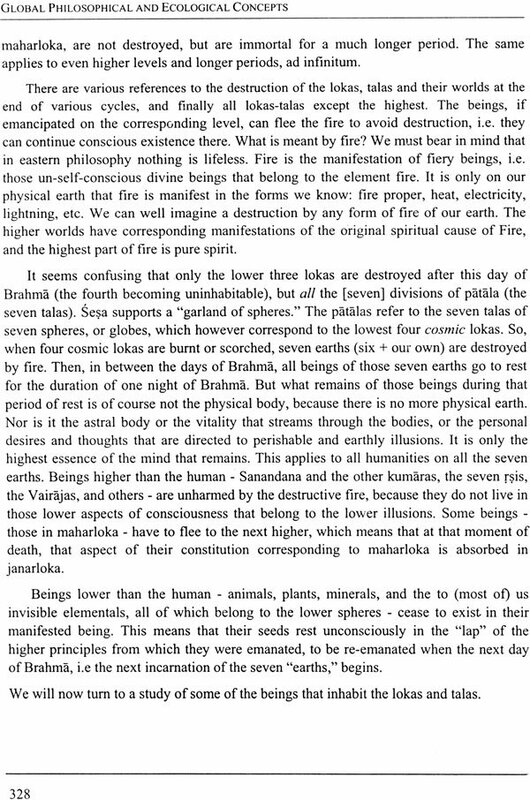 As there is a vast scale of substance-forces existing in all-various degrees of ethereality, so 'there is life per se, in individuals manifesting as a vital fluid belonging to each one such grade or stage or place of material manifestation- and these vital fluids in their aggregate form what we may call the Universal Life, manifesting in appropriate form on any one plane and functioning therefore through the various matters of that plane''' (ET 431). "Life is an entity or process is all that is, the basis or essence of all that is beginningless and endless. 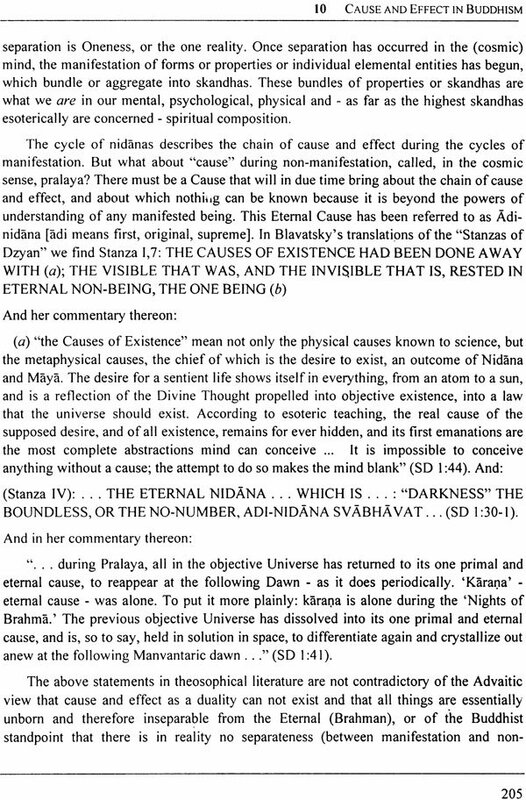 It is the spiritual electricity, or the vital svabhava, of the monad [immortal essence, jiva], which it pours forth out of itself and thus produces the individual characteristics of every entity, celestial or terrestrial. As the divine monad is a breath of pure spirit, pure consciousness, life may be called the innumerable manifold phases of consciousness in time and space. 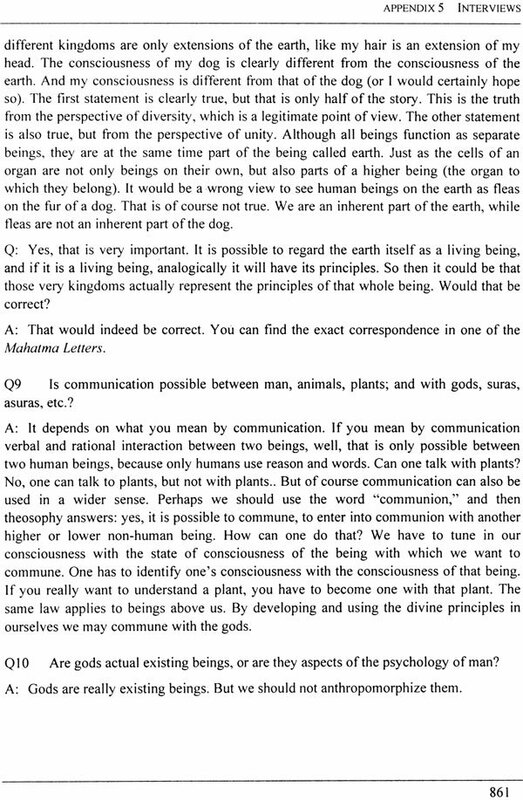 'Consciousness is the originant, and this originant by its own inherent powers and energies, faculties and attributes, produces life out of itself: not at any one time specifically, but continuously forever, and coincidentally with its own existing duration. Consciousness and life together originate and produce thereafter from themselves what men call the manifestations of force of energy, which in its turn deposits or lays down, so to say, the matters and substances of the Universe, much as wine will deposit its lees''' (ET 749/ETG). 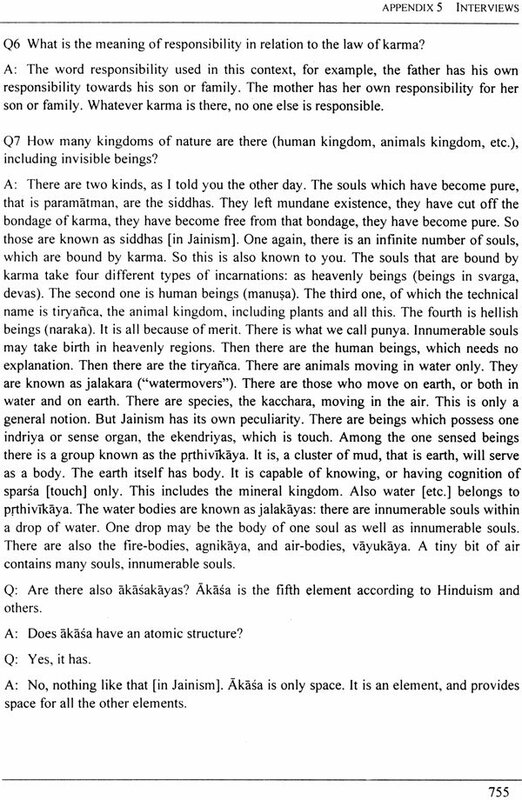 The term jiva is used for life or living soul in Hinduism and Jainism, especially when referring to the eternal essential living soul of each being. Prana is the term used for the life as it manifests as streams of energy in each individual which withdraw at death, and pervade every cell or atom during life. 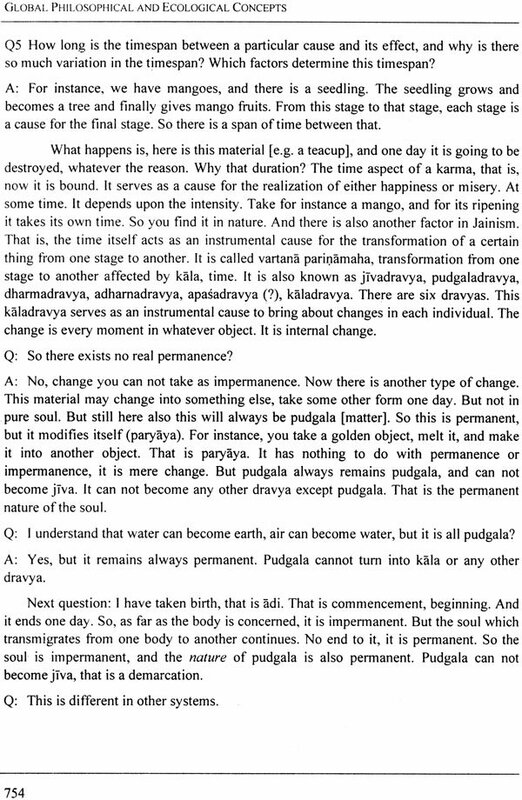 Thud so-called life and death are but different phases of the eternal life of the jiva or living soul. Another remarkable thing in the western mind is the almost absolute separation between certain scientific disciplines the one utterly ignorant about the other. 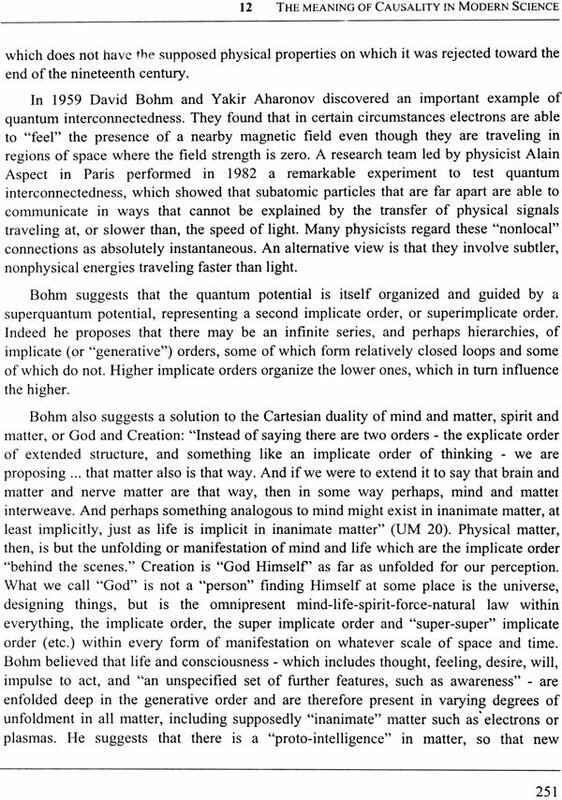 Here I refer to the separation between the physical sciences and parapsychology. Parapsychology has in the last few centuries delivered thousands and thousands of proofs of the existence of life after death, spooks, apparitions, spiritualistic phenomena, gnomes, elementals, remembrances of former lives, etc., etc. 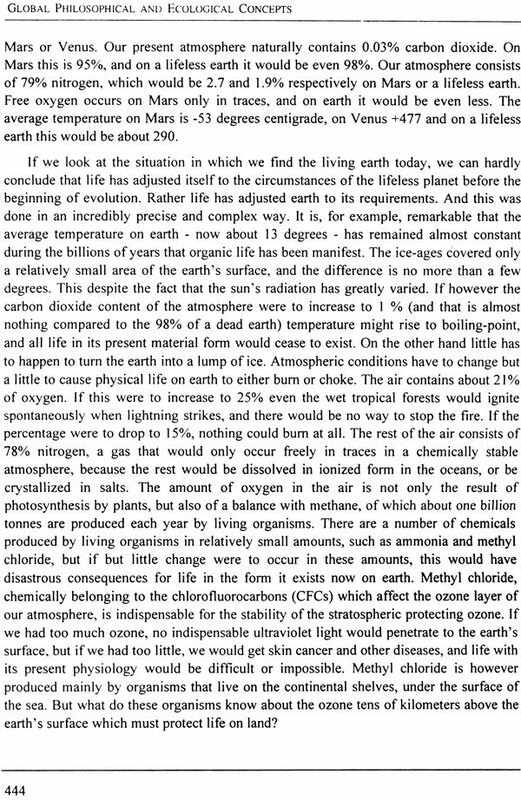 This science has made it impossible to sustain the belief that life is confined to physical structure. What if your grandfather can still appear and tell you sensible things after his corpse has decomposed? 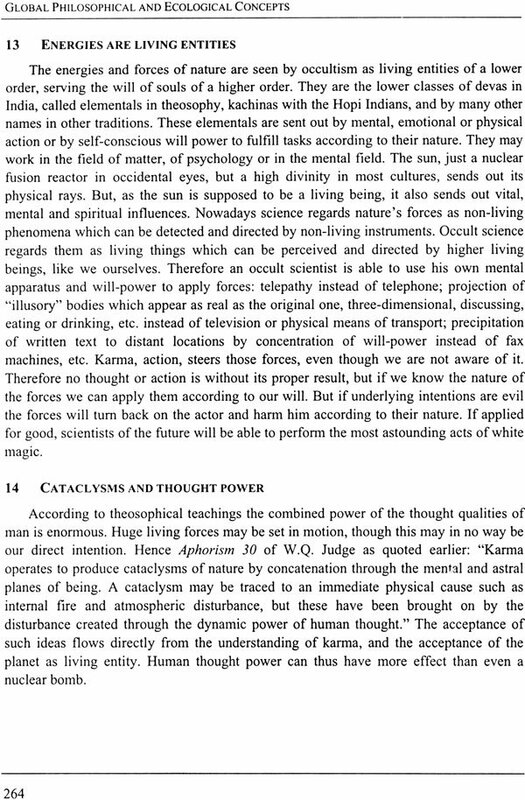 Parapsychology is not a part of the present dissertation, but seems to have sufficiently proven that life-forms. So, is it impossible that people who stand closer to nature or are spiritually and psychically more receptive than most of us, have indeed gathered genuine and true information about invisible (non-physical) forms of life? We must take into consideration however that a lot of spiritual knowledge can not even be imagined by the minds of common people, and therefore is packed in a symbology that can be understood only when one is ready for it and the keys have been given. This symbology may take very different forms in different culture, though the symbols may for each be entrances to the same worlds of reality. Of course I am referring to genuine knowledge, not to the humbug that is sold at the street corner, especially in the modern western society. 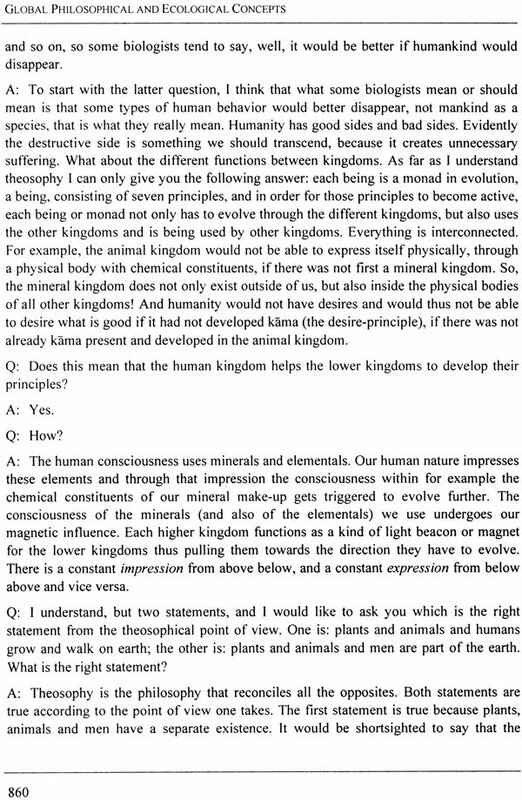 So, perhaps there are life-forms have been given in all corners of the world, including modern theosophy, and these details suggest that the approaches of such cultures have been scientific and can indeed be factually known, and that, if our own sciences become more open and spiritual, we too can know such worlds and learn what the forces and divinities of the universe really are. Cyclic processes are fundamental in manifested nature. 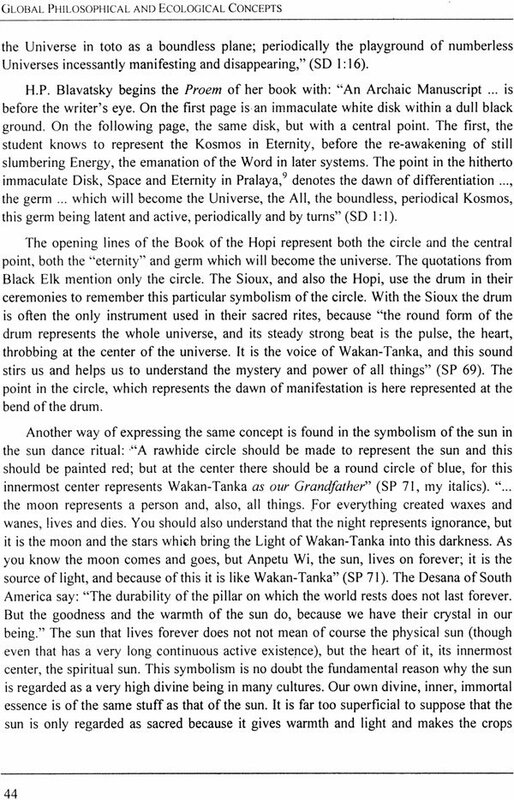 They are recognized in such phenomena as the cycles of day and night, of the seasons, of ebb and flow, of the movements of celestial bodies and intra-atomic movement, etc. Cyclic processes have been acknowledged as fundamental by most great cultures of past and present. 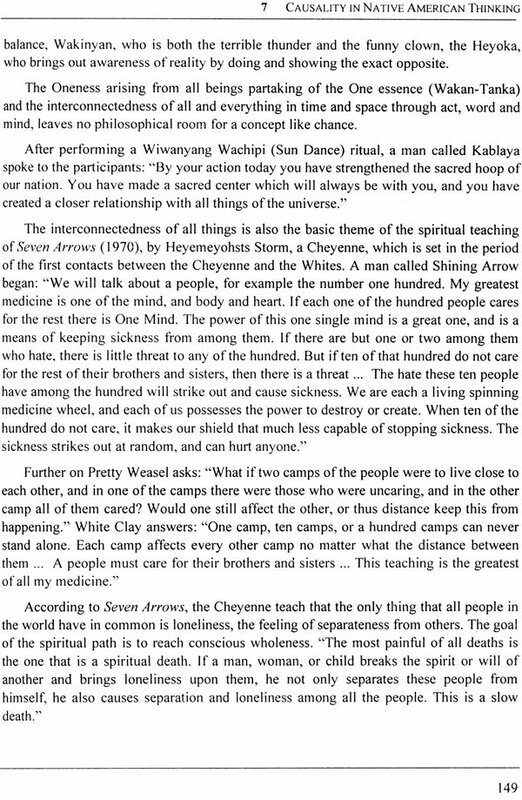 For this reason the circle is a most sacred symbol among many Native Americans. 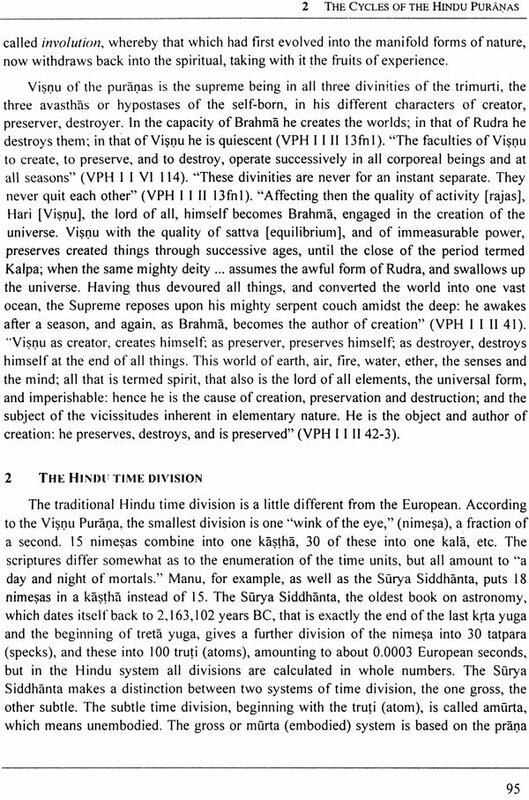 In Hinduism cycles linking every event in the universe, from the smallest to the largest. Most important, partly because of its ethical and psychological implications, is life as opposed to death. 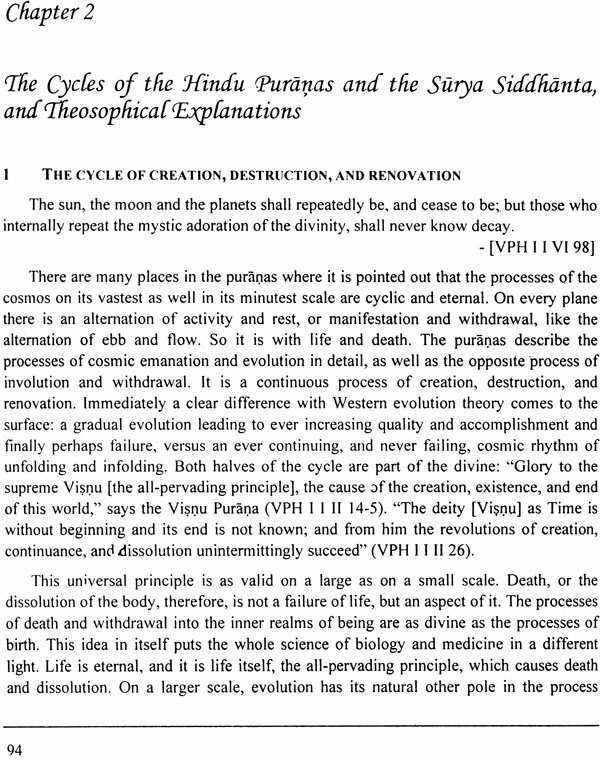 With many cultures life and death have been recognized as a cyclic alternation comparable to "life and death" of the sun each day, which means that something continues when life has withdrawn from the realm of visibility and later returns to manifested physical existence. 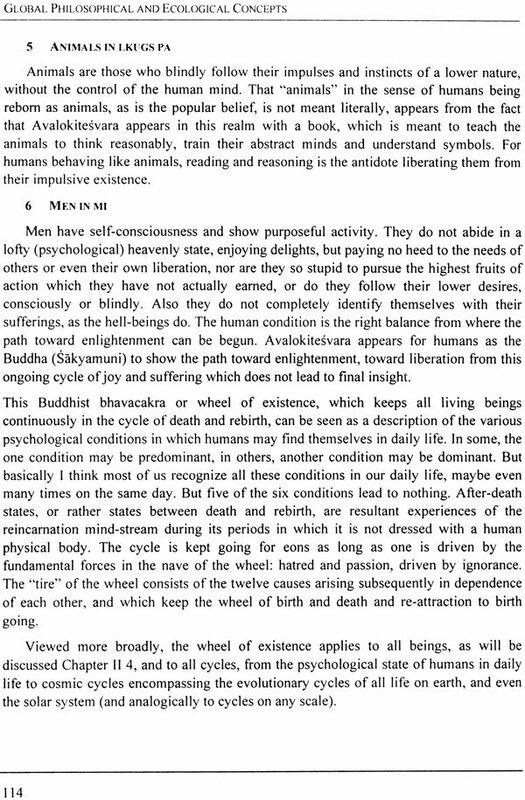 In Buddhism the cycle of rebirth (bhavacakra) is a basic teaching, and Tibetan Buddhism in particular contains detailed descriptions of after-death states of consciousness. 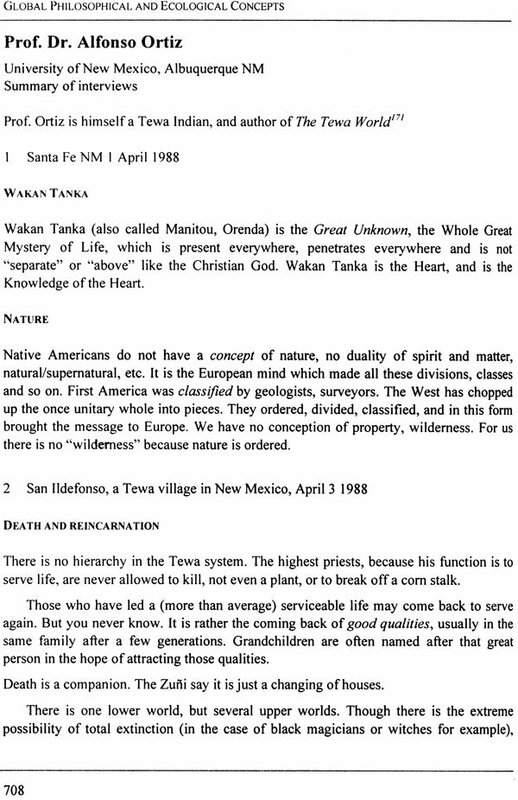 Also many Native Americans are acquainted with the concept of reincarnation or reembodiment. Events are the results of previous causes. Results are expected to follow causes mathematically, and if related to matter in strict correspondence with the physical laws of nature. But the interpretation of causality varies greatly with different cultures. In occidental thinking the concept of chance has been introduced and absolutized, which makes it possible to calculate with the results of untraceable causes. Forces that transmit the information contained in a cause are supposed to act blindly, and uncontrolled by mind and intelligence. Other cultures seem to have explained results of unknown causes as fate, depending on the will and imponderable mind of God or gods. 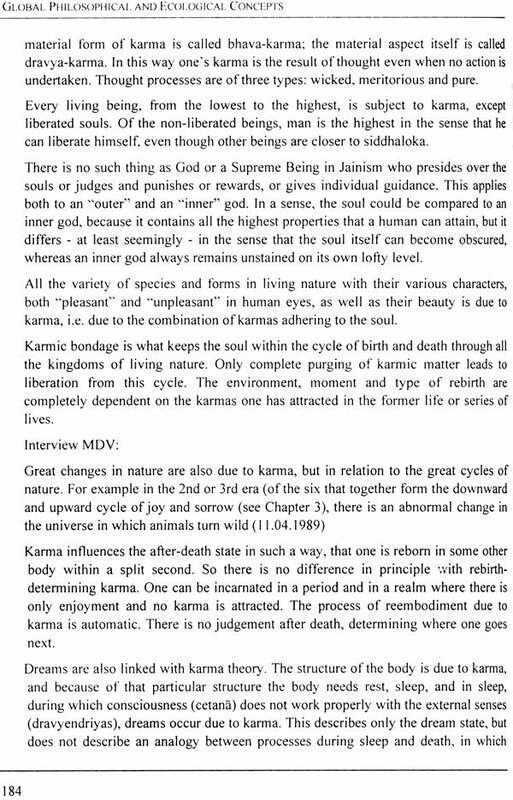 In the Indian systems the concept of karma is very important, which is neither blind, nor controlled by higher being outside the actor, but is the eternal "habit" of manifested nature to restore the balance, working on all levels of existence and for all being, including the gods. 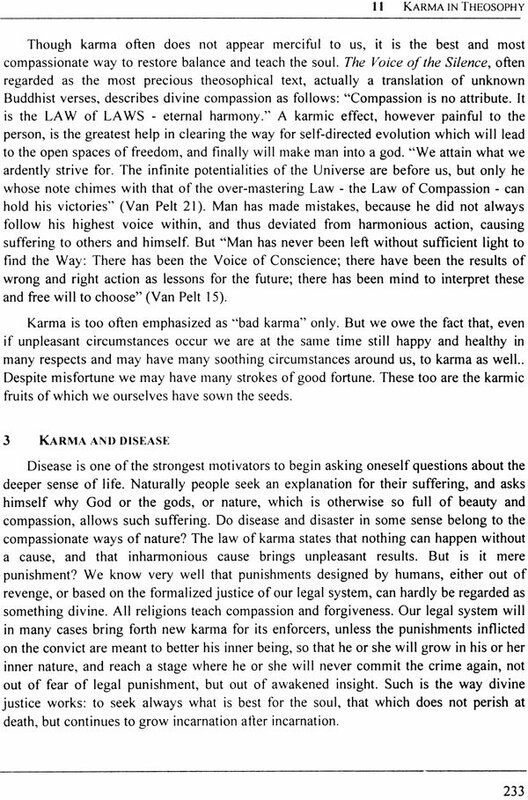 The explanations of Karma given by Hinduism, Jainism and Buddhism lay emphasis on different aspects of this universal doctrine. 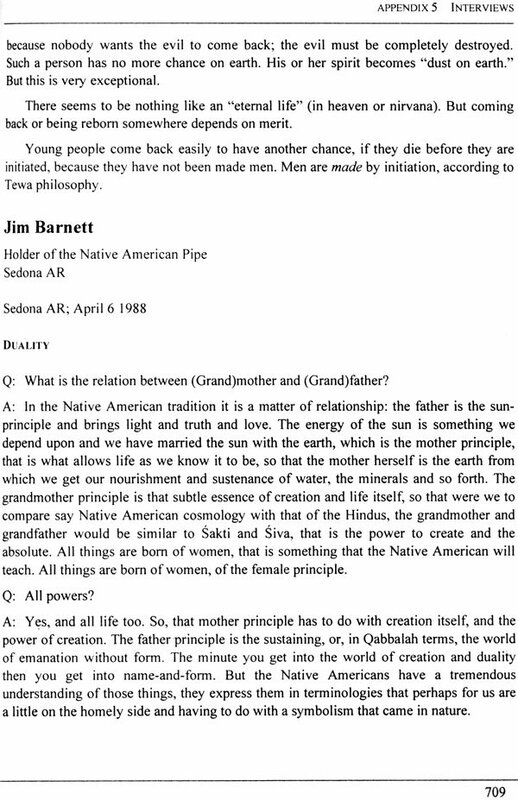 We will see that, hidden beneath the surface of myth, the knowledge of karma exists with Native Americans as well. 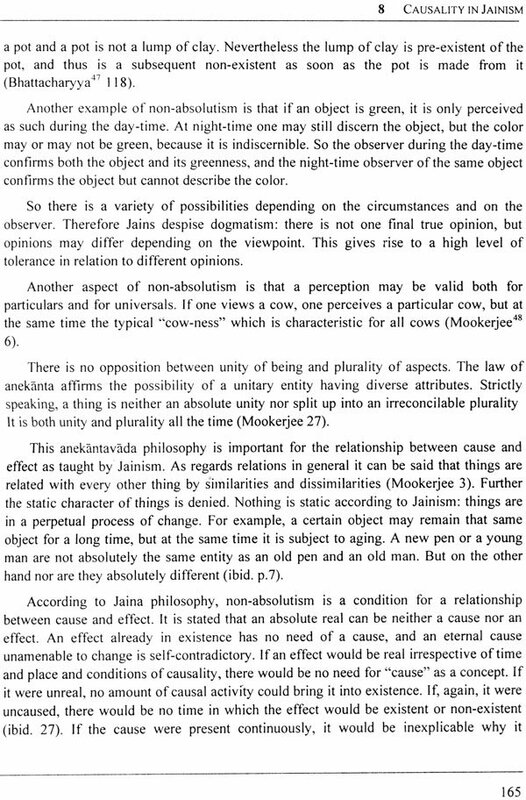 Causality is thus directly linked with individual responsibility in action and thought, and consequently with ethics. Karma is cyclic: results of actions sooner or later return to the actor. 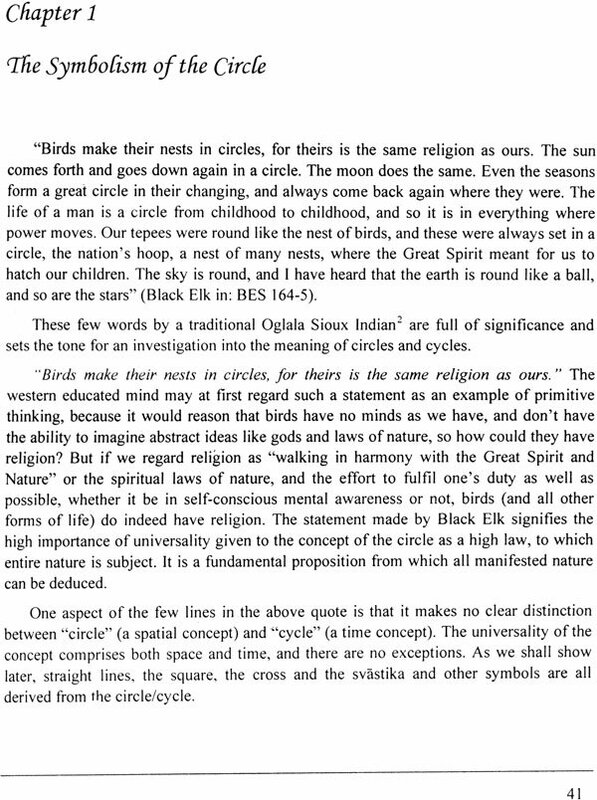 Ecology is the science concerned with the interconnectedness of things "especially as manifested by natural cycles and rhythms" (Webster's third international dictionary). Occidental ecology studies an ecosystem as a unit of individuals each striving for their own benefit, adapting to the given and changing biological, physical and chemical environment. At best beings cooperate because they co-evolved into a condition of mutual benefit. The interdependence of certain creatures, such as figs and wasps, has been established by accidental evolutionary steps, which finally led to a situation beneficial to both. Being successful, even the possibility of independence was selected away. What is hidden beneath the surface of ecological and evolutionary theory is a metaphysical motivation of self-preservation, success for oneself, and selfishness in general. There is in the pessimistic occidental view no recognition of an inherent factor of service to a greater purpose in nature, service to the community of all beings on earth, or of a harmonious overtone to which all being (unconsciously, semi-consciously, or consciously) obey. The west has lost the idea of a divine presence pervading all things, of a spiritual musical score according to which each plays (or tries to play) its individual tune in the universal symphony. 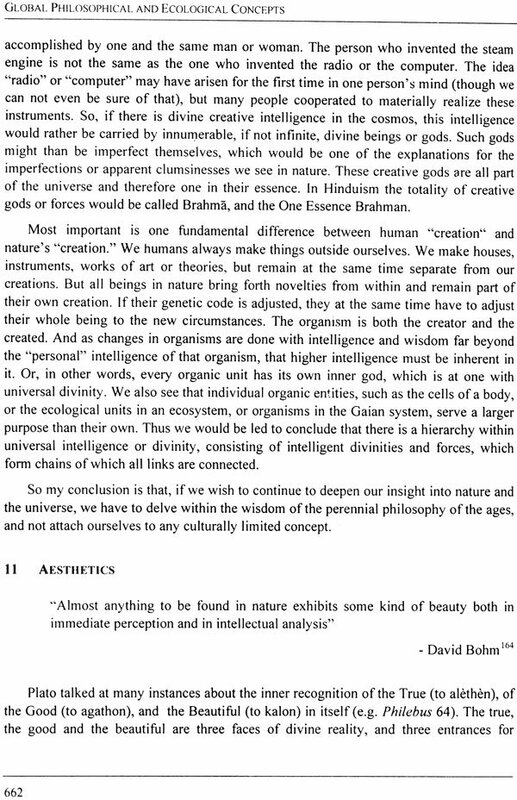 The predominant scientific opinion sees only "blind" matter, but not intelligence, nor divine consciousness of beauty and harmony as inherent parts of an ecosystem. Yet who does not stand in awe when allowing himself or herself to be engulfed by the soft sounds of a tropical rainforest, or when abiding in places of pristine purity in nature. The view is different with other cultures. Buddhists see the Buddha-nature- which means wisdom and compassion, not blindness and selfishness-inherent in all manifestations of nature. According to Buddhism everything serves a higher purpose to reach the final goal of evolution. Everything helps everything because that is the real meaning of compassion. Evolution will lead us to unsoiled awareness of the essence of all being, unsoiled by any illusionary or erroneous mental perception. The obvious cruelties which keep the ecological balance within the animal kingdom are then considered just ripples of transient imperfection on the road to unspeakable and universal insight and bliss. These imperfections in the human as well as other kingdoms of nature are karma- results of actions disharmonious with the higher inner laws of nature. We with our senses and instruments can perceive only the omnipresence of physical matter and the coarser manifestations of energy. 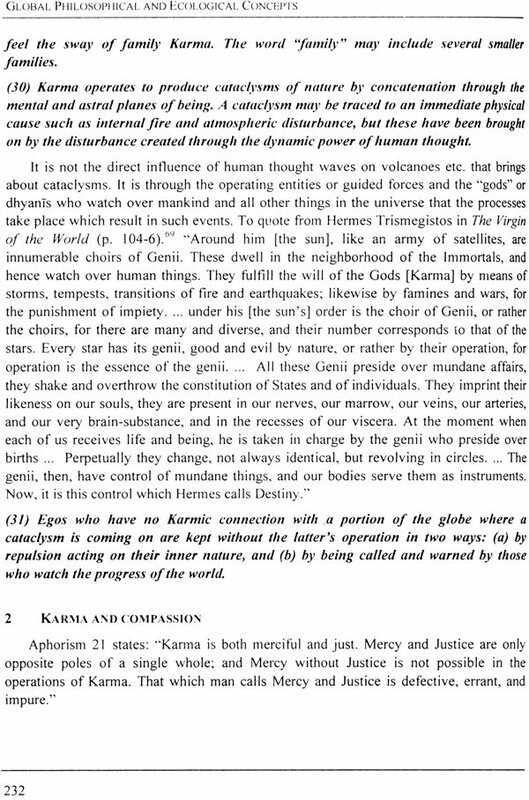 But from the standpoint of theosophy or Hinduism all principles of nature are omnipresent. Mind is considered by them omnipresent in the universe; so is intelligence. 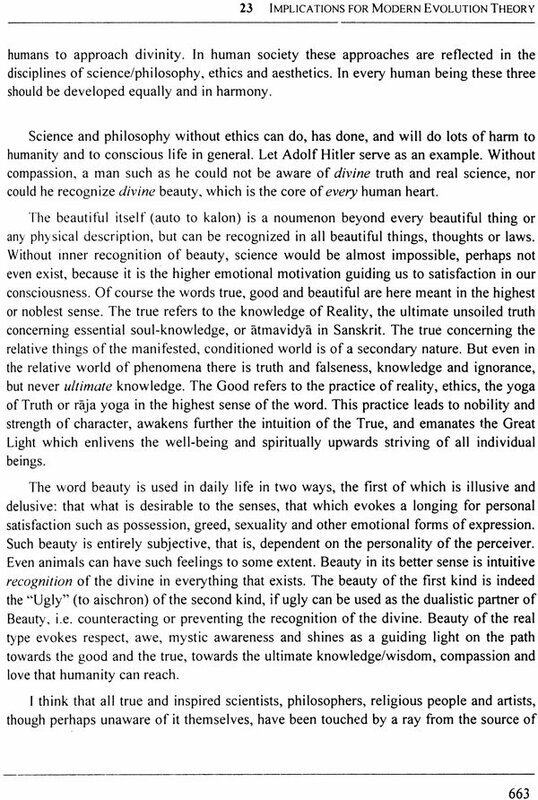 Beauty is then a reflection, recognition, of the divine presence in every facet of nature. 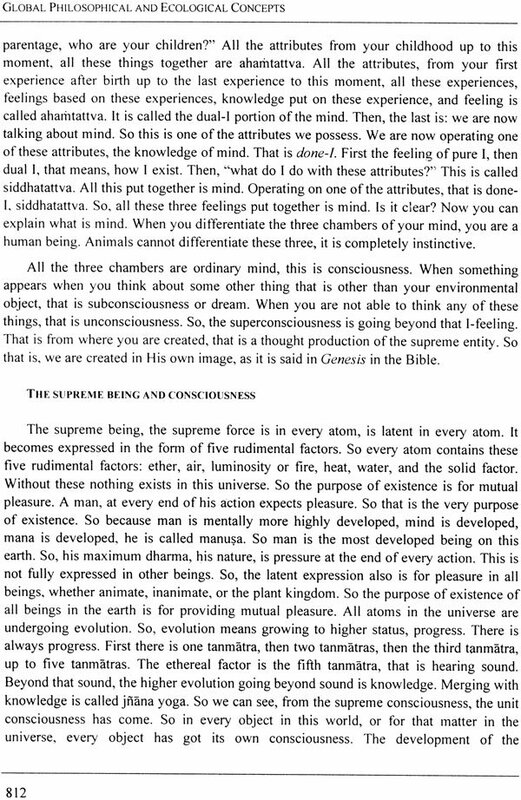 Desire is everywhere: it was the motor of each universe's birth as well as of each individual action. Life is everywhere, and so on. We humans and other living beings contain all these universal principles within us. 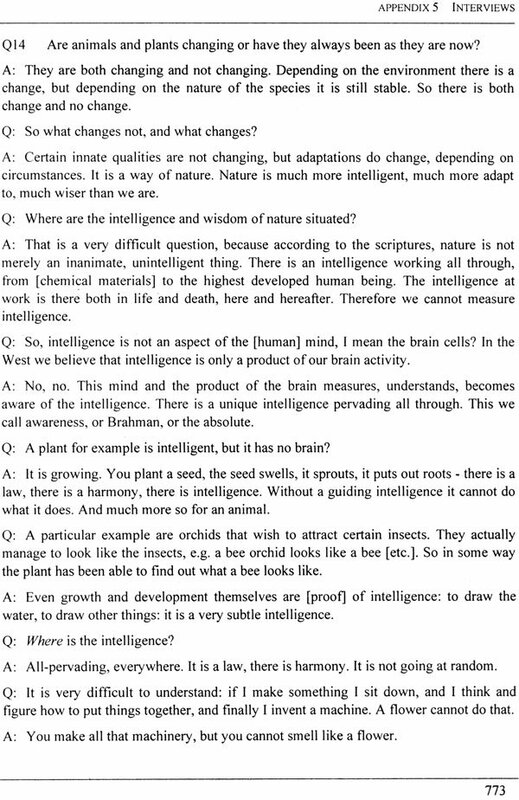 Our intelligence is a small-scale and but slightly awakened drop of universal intelligence. Are these ideas, reflected in the philosophical systems of cultures which have often shown themselves superior to the west in social, artistic and environmental accomplishments to be put aside as superstitions? Are these in any sense less philosophical than the occidental new cultures of the future? We see that the ecosystems of non-western cultures include numerous hierarchies of invisible beings of a higher or lower nature. 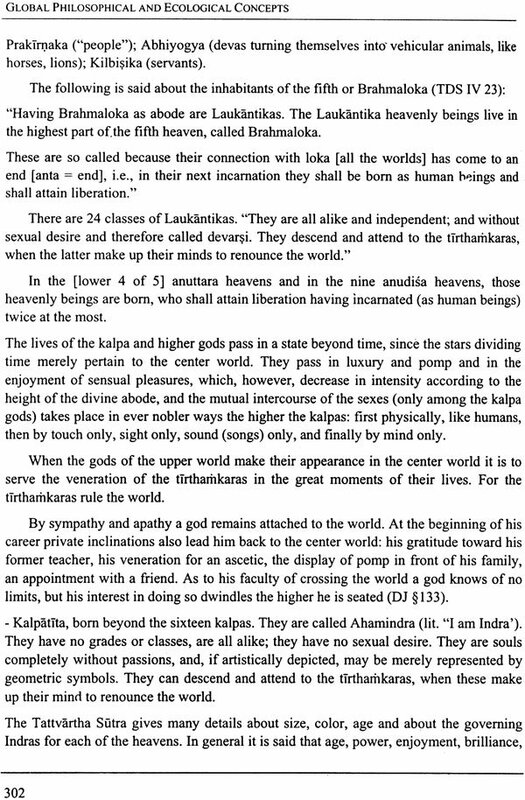 Trained yogis or occult initiates in the higher Mysteries are said to be able to communicate with and understand such creatures. There is record of devoted students of spiritual truth who can confabulate with the "gods," and thus transfer their influence by their insights and works for the well-being of humanity and the kingdoms of nature. In a sense we all do so in a degree when we really unselfishly attune our mind to what is beneficial universal truth for the well-being of others, above the illusions of our personal opinions. This leads to promptings of unselfish love and intuition. At the realms of the physical as well as spiritual ecosystems seem to exist within us: we are humans, but have the animal desire, vegetable vitality, and mineral firmness within us. 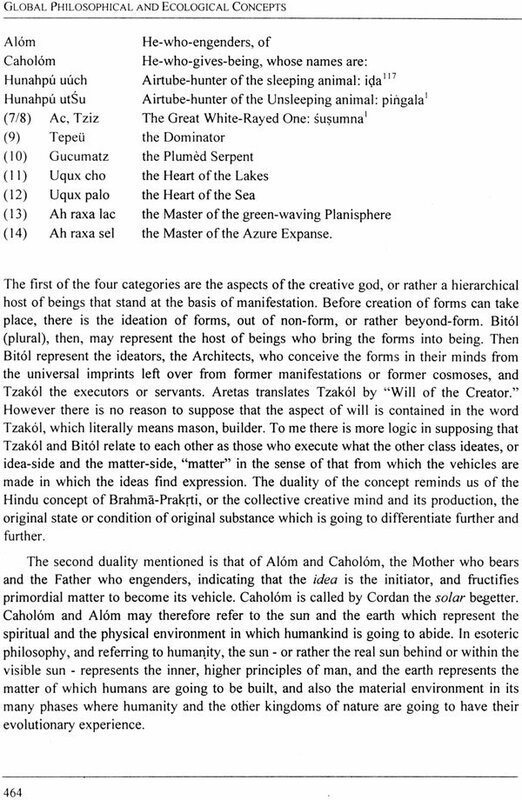 But we also have higher levels within our psychological constitution, represented by hierarchies of divinities situated within again hierarchically ordered levels. If such higher and more subtle hierarchies would be studied from a psychological point of view, we would learn to recognize the higher and refined aspects of our own psychology. Every species of living being and even every individual has something that causes it to be essentially different from others. According to the doctrines of Darwinism and neo-Darwinism, new characteristics may come into existence through sudden changes in the genetic information, probably due to outside influences. They may also disappear through the same mechanism. 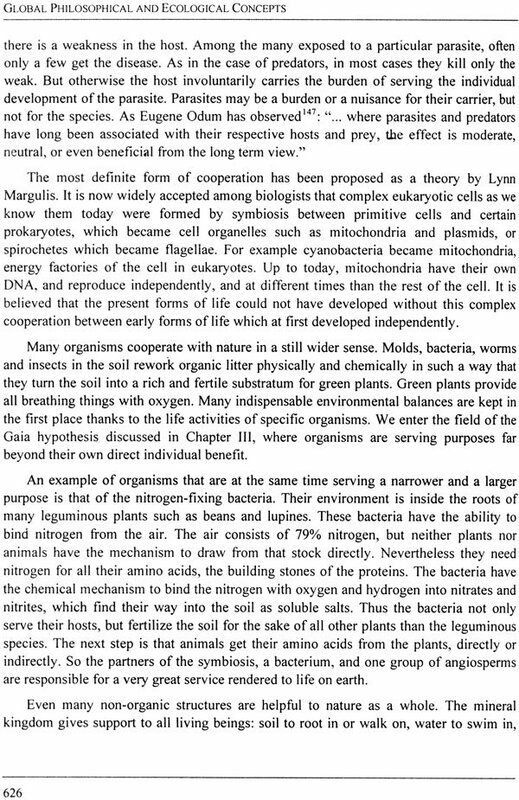 This is the basis for speciation (formation of new species) and the answer to the question of the origin of species. From biblical and other sources the origin of species has been understood by some in the sense that God created all species as they are and that these never change. One may of course question whether this is the real meaning of the teaching in the Bible, and whether the theory is philosophically sound. In some of the eastern system we find the concept of svabhava, which, may be understood as "essential characteristic" and which literally means "self-being" or "self-becoming." It means that every species, and indeed every individual, has a spiritual monadic essence which is its own source, and from which all further characteristics come forth. 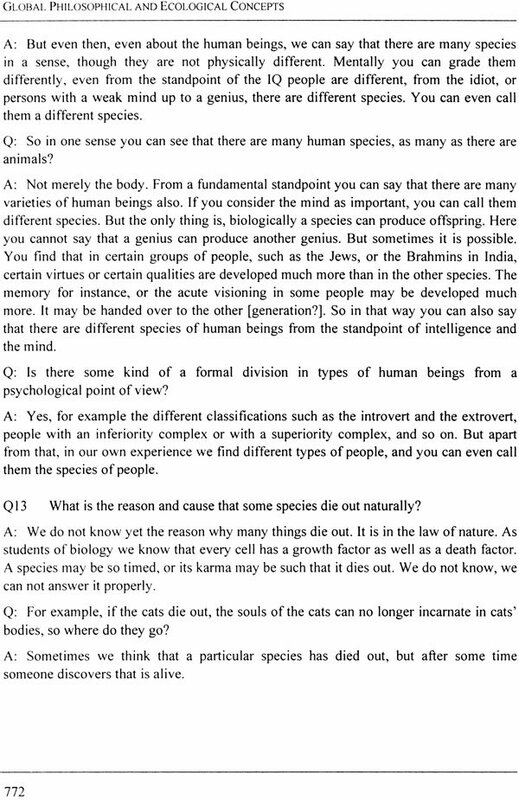 The teaching seems to lead to the conclusion that the essence of a species has always existed, but sequential manifestations of this essence may vary. 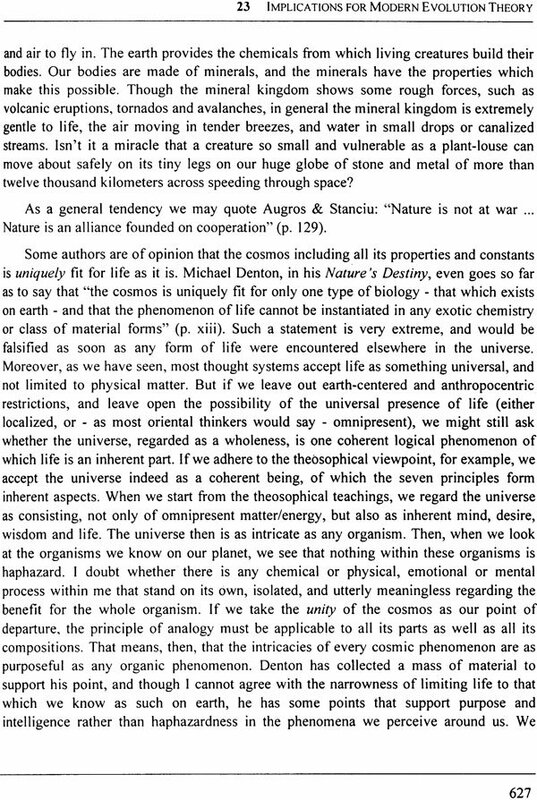 From this point of view species may be either fundamentally deferent of sequential manifestations of the same essence. Species in the modern scientific sense are then only temporary manifestations of essence which exist during long cycles of evolution. 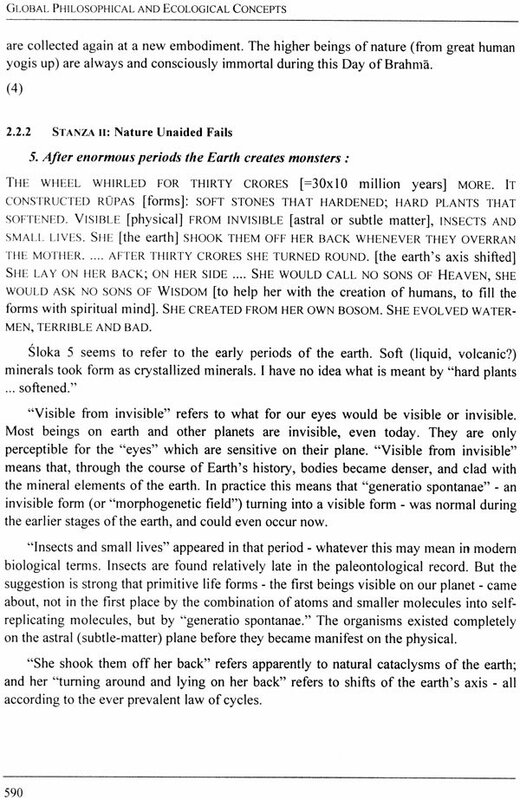 The concept of svabhava is most important in relation to evolution theory. Evolution is one of the most prominent subjects of study in modern biology. The concept of evolution is relatively young in western culture, and even today evolution is denied by creationists within the dogmatic Christian traditions. 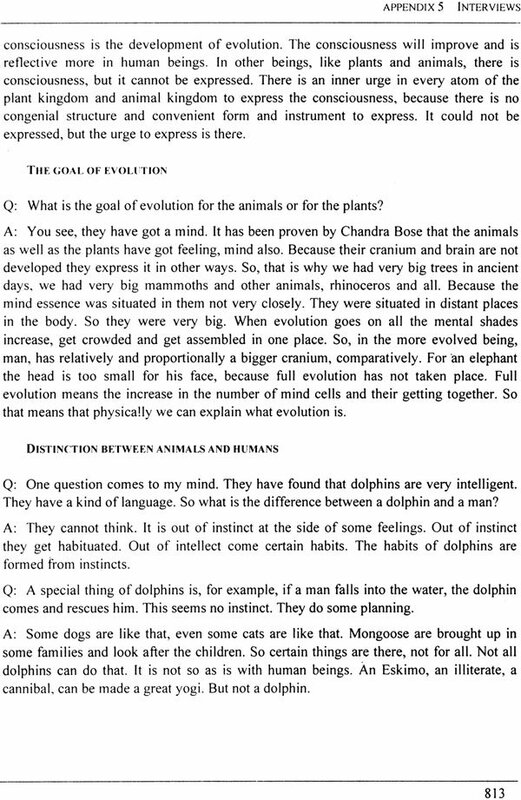 In India, and also in America, teachings on evolution are thousands of years old. Modern evolution theories describe and explain the transformation of one form into another. This is however not the real meaning of the word evolution, which means to roll forth, to unfold (from within). 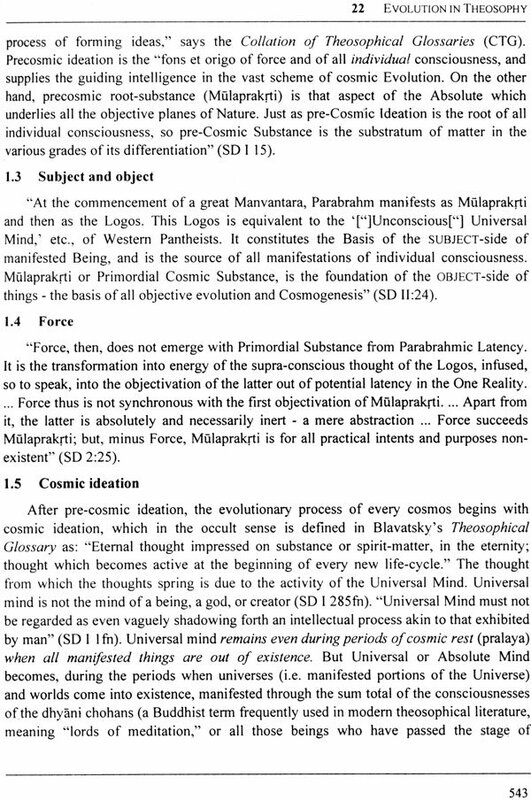 The Sanskrit concept of pravrtti comes closer to this. Pravrtti is linked with nivrtti (flowing back), or involution. Because, how could things evolve, if they have not first been involved, and vice versa? So it is a cyclic process. 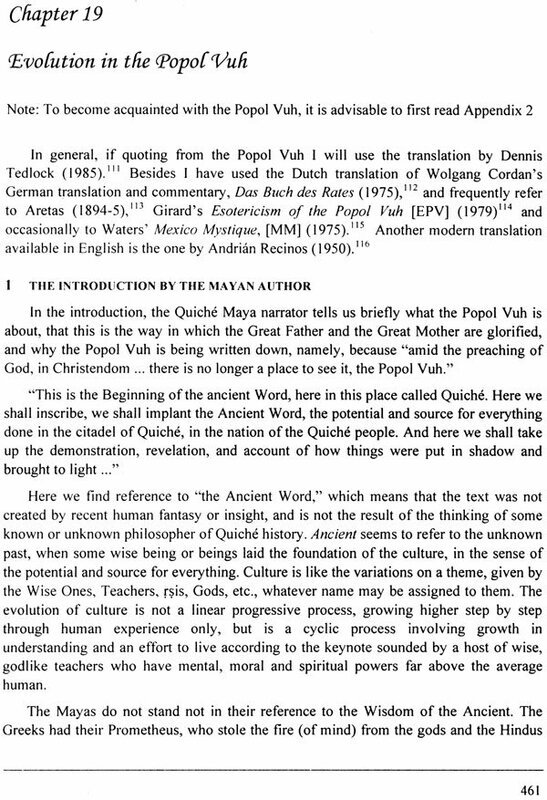 In the ancient west, the Mayas had their popol Vuh, which contains a very interesting narrative on evolution, including human cyclic evolution. 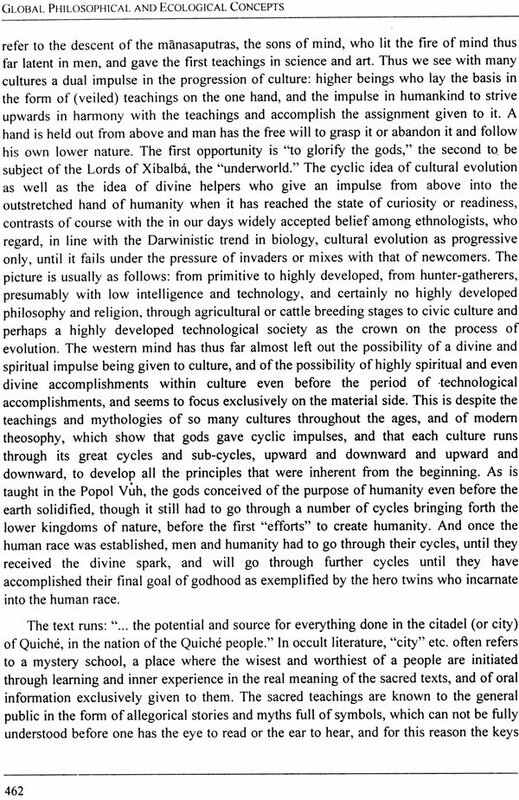 Most cultures teach, if they have a concept of evolution, that soul or mind existed before the processes of evolution began, and that the divine awoke first to guide evolution. The outward evolution of forms- the subject of scientific evolutionary studies is but an outer expression of inner evolution. Every evolutionary expression has a cause in consciousness. 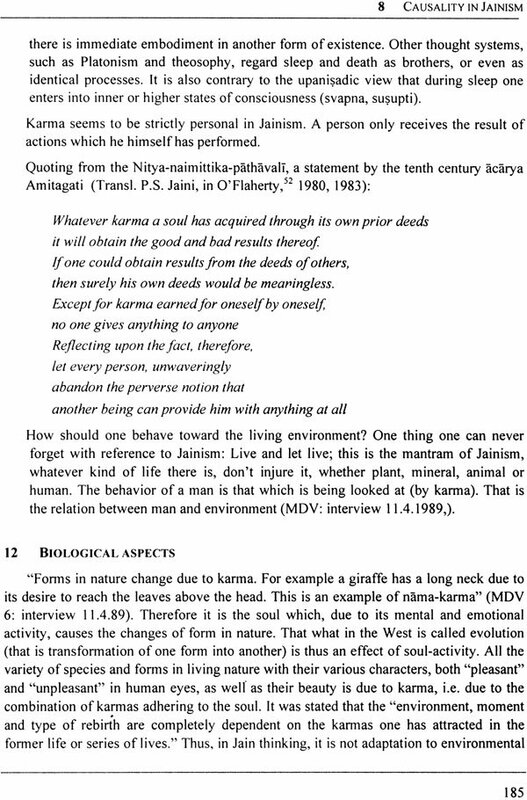 This is comprehensively discussed in the Chapter 8 on Jainism in section II. Inner evolution means the unfoldment of all inherent qualities of the soul, step by step, to which outer forms are adjusted, also step by step. 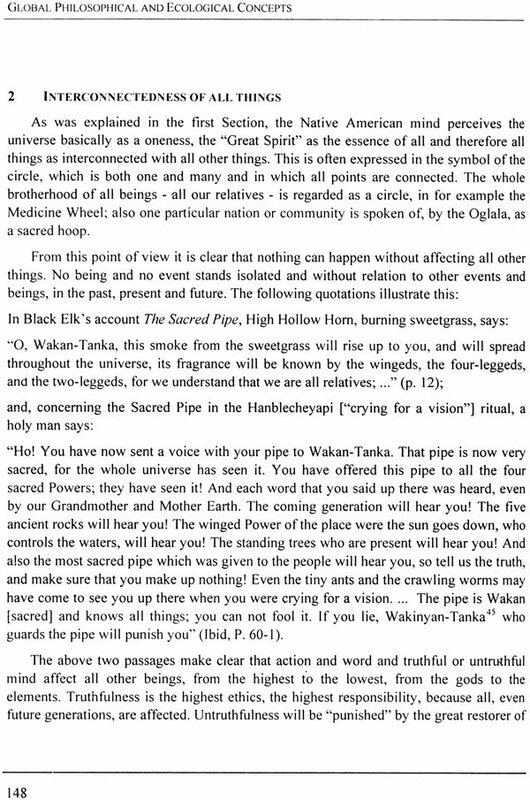 Moreover evolution is circular, or rather spiral, breathing out and withdrawing again and again. The prevailing occidental idea is that evolution is linear, either smooth or jumping, the result of chance material processes on the one hand, and the desire to survive as metaphysical motivating force on the other. 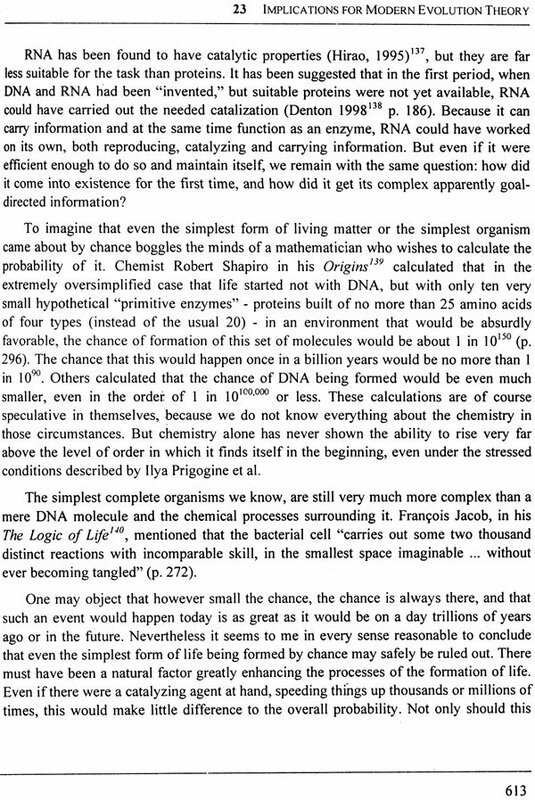 There is no purpose other than individual survival- or rather that of each individual genome- and teleology might be called the greatest heresy in evolution science. Just as in ecology, mind, intelligence and their possible purpose are not taken into account, except when the human mind comes into play and gives humans partly the power to direct their own mental and intellectual evolution. Not every culture has an explicit doctrine of evolution, but they definitely see a purpose of all life which we recognize through our innate higher longings. 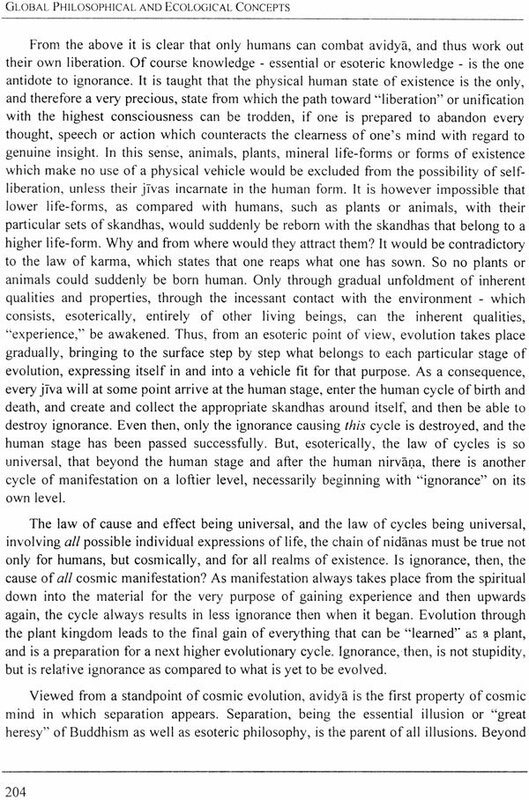 Evolution may run in cycles of ever higher unfoldment, thus making it cyclic rather than linear. Every next event in evolution finds its root in an earlier cause: the inner desire to move in a certain direction, which leads to its necessary result according to the universal natural law of cause and effect. It has been universally recognized that nature has a spiritual and a material side. But are spirit and matter, energy and matter, mind and matter, good and evil, God and Devil separate or dual aspects of the same thing? In the latter case, spirit is but ethereal matter. Or matter gross spirit. If spirit is infinite, there is no room for a second infinite. The finite can be but an illusionary aspect of the infinite. Reality is one, eternal, non-dual and omnipresent. If spirit and matter are inseparable and indeed two aspects of the same, this inseparability applies ultimately to all dualities in nature. It means that all principle of nature are inseparable aspects of the one universal life-consciousness. Consequently, instead of being forever doomed to speculation on what we will never really understand, we will be able to unveil for ourselves the ultimate truth of the universe, because our mind is one with it, and wisdom. Everything in the cosmos exists in an absolute oneness. This conclusion shakes the basis of the prevailing occidental world view. Man being part of nature, his faculty of knowing nature is an inherent part of that same nature. Thus nature has its own built-in possibility to be known by conscious beings. Can we known it in its deepest essence? 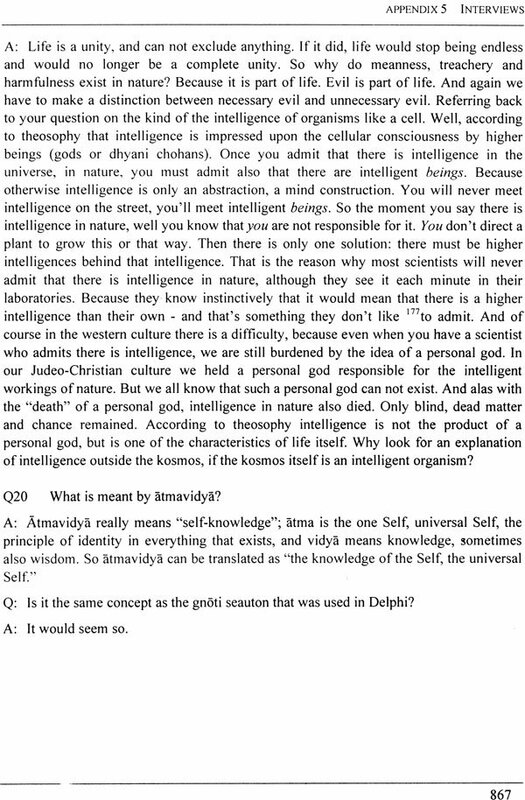 Does evolution have an inner purpose: the knowledge of our essential self, which because there is no separateness in non-dual nature, is the same as knowing all? Perhaps rather than our instinct for survival, it is our inborn drive toward perfection in all respect which is the motivating force of evolution. With this study a work is begun and hinted at which may stimulate centuries of research along new lines and lead humankind in entirely new directions, though all is based on existing insights, the heritage of the world's culture throughout the ages. The author was trained as a tropical ecologist, and became inspired by the more refined stories that living nature tries to tell. He worked for several environmental groups concerned with education and advice about the beauty of tropical nature and the problems created by human attitudes toward it. He became aware that it is the human mind which creates these attitudes, and that this mind is fed from childhood mainly by ideas which spring forth from one culture- that of western science. If we really wish to change our attitude toward nature, the ideas which feed the mind should be taken from other sources as well, especially from those which show great intuitive insights, giving rise to attitudes toward nature which bring more happiness to all.